There are have been reports that the East Asian tick has spread to the United States. This tick is one of the only known carriers of the deadly SFTS virus. This virus was first discovered in China in 2009. Each year there are more people that contract it. While there are no known cases of the virus in the United States, scientists are worried that it could spread now that the East Asian tick has established itself here. What Are the Symptoms of the STFS Virus? The SFTS virus starts out with a fever. The patient may also experience nausea and diarrhea. The virus can affect the liver making the enzyme levels off. It can also lower both the platelet and white blood cell count, which can make people more vulnerable to complications. Some people will suffer multiple organ failure as a result. The mortality rate is currently about twelve percent, but it was higher when the disease was first discovered. Early identification of the disease seems to increase the chances of survival. Treatment is focused on treating and managing the symptoms since it is a viral illness. Is the STFS in the Manassas Area? The STFS virus has not been identified in the United States. The East Asian tick has only been found in New Jersey at this point, but it is expected to spread across the United States as it is an extremely invasive species. 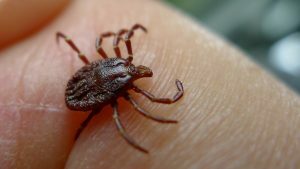 Officials worry that the SRTS virus will be able to spread quickly once the East Asian tick is firmly established throughout the United States. Should I Be Worried About Other Ticks? Scientists have predicted a very active tick season in the Virginia area this year. This means that you should take care to protect yourself and your family from the ticks that are already in Virginia and that can make you sick by spreading tick-borne illnesses like Lyme disease. You should always wear insect repellent with DEET in it if you are going into an area that has a lot of ticks. You should check yourself, your family members and your pets for ticks regularly. You can give your pets a tick preventative. You can also treat your yard for ticks to decrease the chances of being bitten. If you do find a tick, you should remove it with tweezers and dispose of it properly. This will help reduce the chances of you contracting an illness and stop the tick from biting anyone else. Ticks can spread serious illnesses. They can make you and your family quite sick. People can get ticks when they spend time outside. They are more common in wooded areas, but they can also be found in the suburbs and in the city in parks or yards. They will feed on animals that run through the yard and they can put your family at risk. The best way to remove a tick is to grasp it with tweezers and to pull straight back to remove it. You do not want to twist as this may leave the head embedded in the skin. You can also use a tick key to remove the tick. You should never try to remove it by burning it, or applying gasoline, rubbing alcohol or Vaseline to it, as this may cause it to regurgitate and increase the chance of being infected. How Do I Tell that a Tick Has Attached to Me? Tick bites are painless, at least while the tick is attached. It is possible to have a tick attach and detach without you realizing that you have a tick. It is important to check yourself after you are in an area that has a lot of ticks. You need to check under your arms, along your hairline, in your ears, behind your knees and between your legs for ticks. What Do I Do Once I’ve Removed the Tick? Once you remove the tick you should put it on a cotton ball that has alcohol on it and seal it in a zipper bag. You can dispose of it this way. You should not just let it go because it can attach to someone else. You should not crush it with your hand or fingers because you may end up contracting the illness. How Soon Will Tick Symptoms Appear? 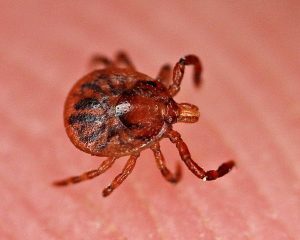 Tick-borne illnesses can have symptoms start about three days after the bite, but they can take up to thirty days to appear. Many of the symptoms are similar with the start of a fever, and aches and pains. Some illnesses will have a rash, but the rash does not always present. The doctor can run tests to confirm the type of illnesses and determine the correct course of treatment. Most illnesses need to be treated with antibiotics or they will continue to get worse and can have serious complications that can even be fatal. Do Ticks Detach by Themselves? Once ticks have finished feeding, they will detach and then wander around until they are ready to feed again. This means that they may live in your home and be waiting until they are ready to feed again. If you see a tick in your home you need to take care of it right away by having the exterminators at Mosquito Tek treat your yard with an effective commercial strength tick control treatment that will completely eliminate ticks around your home. 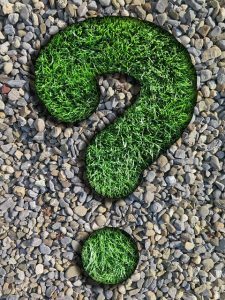 Where Can Fleas Live in My Home? When you notice that your pet has fleas, you may be worried about how to get rid of the fleas. Fleas may not stay on your pet. They will hop off in search of other hosts. This means that they can spread throughout your home. Considering that a single flea can lay more than fifty eggs a day and that those eggs will fall off your pet, you do have reason to worry about fleas living in your bed and in other areas of the home. Unfortunately, fleas can live in a bed. They may also live in your sofa or in your carpet. They are most likely infesting your pet’s bed as well. It will take a series of specific steps to deal with fleas that have decided to make your home theirs. 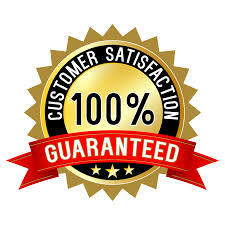 You may already have treated your pet, which is the first step. These steps will help you rid your home of fleas. Wash Your Bedding: Gather up your bedding and wash it in hot water and then dry it on high heat. In order to deal with it effectively, it is best to wash everything all at once, and you may need to go to a laundry mat. To avoid spreading fleas to your car or other people, double bag your items and throw the bags away after you are at the laundry mat. Vacuum Your Furniture: Vacuuming your bed and your furniture can help clear up any fleas because it will vacuum up the adults and the eggs. After vacuuming, you will need to talk the vacuum bag out to the trash. If you have a bag less vacuum, empty it into a trash bag outside and immediately dispose of it. 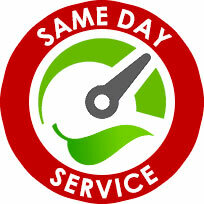 Vacuum Your Carpets: Flea eggs will drop off your pet, and a large portion land in the carpet. Fortunately, they are not sticky and a vacuuming carefully can pick up a lot of them. You should vacuum on a daily basis until your home is flea free. Schedule a Flea Treatment: A professional flea treatment will get rid of any remaining fleas that may be in your home. The treatments are more effective than flea powders and are not as messy. You can also have a preventive applied to your yard. If you are primarily being bitten in your bed, and you do not notice that your pet scratching more often, you may have a problem other than fleas. Bed bugs are becoming much more common. Check to see if you have blood stains in your sheets or that your bites appear in a row. If you see these signs, you may have bed bugs, and you should schedule a bed bug inspection and treatment for that instead. Bed bugs are very difficult to treat on your own. They are also difficult to spot and nocturnal. A flea exterminator is trained on how to find them and treat them effectively. How Can I Tell if I Have a Tick? 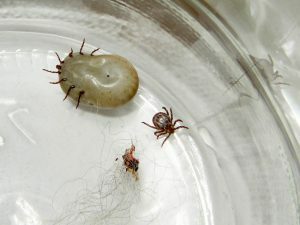 Ticks are small and many people do not realize that they have bitten by a tick until they begin to have symptoms of a tick-borne disease such as the bull’s eye rash or a fever and a headache. The shorter the time the tick is attached to you, the lower your chances of contracting an illness. This means it is important to check for ticks regularly. Can I Feel a Tick Bite? Generally, you will not feel the tick attach to you and bite you. While it is attached, you will not be able to tell that it is there. However, after the tick detaches it might itch. It may also be red. Will I See a Tick? You can see a tick when it is attached to you. However, seed ticks can be difficult to spot since they are very small. Seed ticks tend to bite in the spring, and it is important to pay close attention when looking for ticks during that time. A tick can look like a mole or a freckle, but on closer examination it will have legs. It is a good idea to check for ticks on a regular basis. You can start by checking under your arms, around your waist, between your legs, inside your belly button and the back of your knees. Ticks also like to hide in the ears and around the hairline. You should have someone check that area for you. After you are in an area that is prone to ticks, you should also check your clothing to make sure there are not ticks crawling on you looking for a place to attach. What Do I Do If Find a Tick? If you find a tick on you, you will need to remove it. You should never smother it in oil or lotion or burn it, since this can cause it to regurgitate into you and increase the chance of getting a disease. Simply take a pair of tweezers and pull straight back until the entire tick detaches. Do not leave the head in your skin. Be sure to take note if you begin to feel sick within the next month and mention to your doctor that you were bitten by a tick. Although most dangerous ticks are those who a carrying a disease, you might want to read about which ticks are the most dangerous overall. Do Fleas Live on People? Flea bites can be quite easy, and when you spot them on your pet, you may be worried about all of the work that you will need to do to get rid of the fleas. You may be worried about needing to clean and treat your pets and your home. The most common flea to affect your pets is the cat flea. If you have any flea bites, you may also be wondering if you need to treat yourself or your family for fleas. 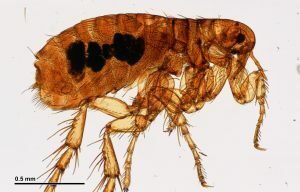 While cat fleas do feed on humans, they do not live on them. After feeding they will jump off of you to look for a new victim. This means you do not need to worry about treating yourself or family members when you begin dealing with a flea infestation. Clearing up the infestation on your pets and in your home will solve the flea problem. The first step is treat your pets for fleas. You can give them a bath in flea shampoo and then use a flea comb to remove the rest of the fleas from their fur. This treatment will kill any adult fleas that are on your pets. In order to prevent future flea infestations or from them picking up any fleas that are currently eggs or larvae, you should start using a flea preventative, which can be a flea collar, oral medication or drops you apply to the back your pet. Your vet can help you choose the best treatment. The next step in clearing up the flea infestation is treating your home. It is important to wash bedding and clothes where fleas like to hide. You need to vacuum carefully both the floor and the upholstery. 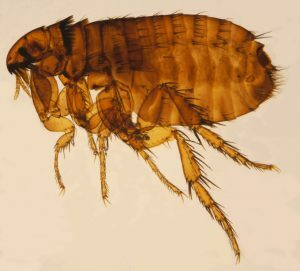 Even with the careful cleaning, it may be difficult to get rid of fleas without a treatment. There are a number of treatments you can purchase at a store, but they can be messy and time consuming. The best option is to contact a professional who understands the life cycles of fleas, and can effectively eliminate the adult fleas and prevent them from reproducing. 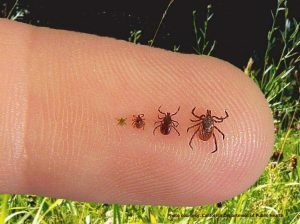 Ticks are carriers of a number of diseases throughout the United States. However, ticks have different habitats and each carry different diseases. When you find a tick on you, it can be helpful to identify the type of tick, so that you can be aware of any symptoms you may develop. This can help you seek medical treatment much sooner. In Virginia, there are three types of ticks that carry diseases. The blacklegged tick looks different at the different stages. As adults, the females have a reddish body with a black head and legs. The adult male is almost entirely brown with a lighter ring around the edge of its shell. The nymph is a light brown color. The nymph is actually the stage where it spreads the most disease. Blacklegged Ticks will spread anaplasmosis, babesiosis and Lyme disease. The lone star tick is a unique tick. The nymphs are a light brown color and more difficult to identify. The males have a patterned back, while the females have a single white dot in its back. The nymph and adult female will spread disease. 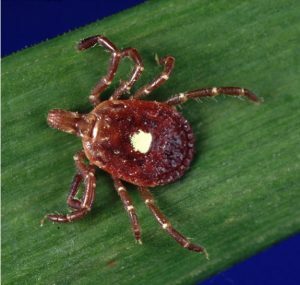 The lone star tick carries ehrlichiosis and tularemia. Additionally, there have been cases where people develop an allergy to meat after a tick bite. The American dog tick is also a common tick in Virginia. The nymph is brown. The adult male has a patterned back, while the female is mostly brown with a pattern right underneath the shell. The adult female is the one most likely to transmit diseases. The American dog tick will transmit Rocky Mountain spotted fever and tularemia. Many tick related illnesses have similar symptoms when they start. Most will start with a fever and a headache. There may be nausea and vomiting. Often a rash will develop which will help the doctor determine the they of disease. Lyme disease has a distinctive bull eye’s rash. Rocky Mountain spotted fever has a spotted rash that starts on the wrists and ankles. Ehrlichiosis will also have a rash. If you catch babesiosis you may jaundice. If you notice any of these symptoms after a tick bite, you should seek medical care. Find out the 5 Ways Fleas Can Make People Sick and what you can do to prevent it from happening to you and your family. Fleas can quickly make your cat miserable. 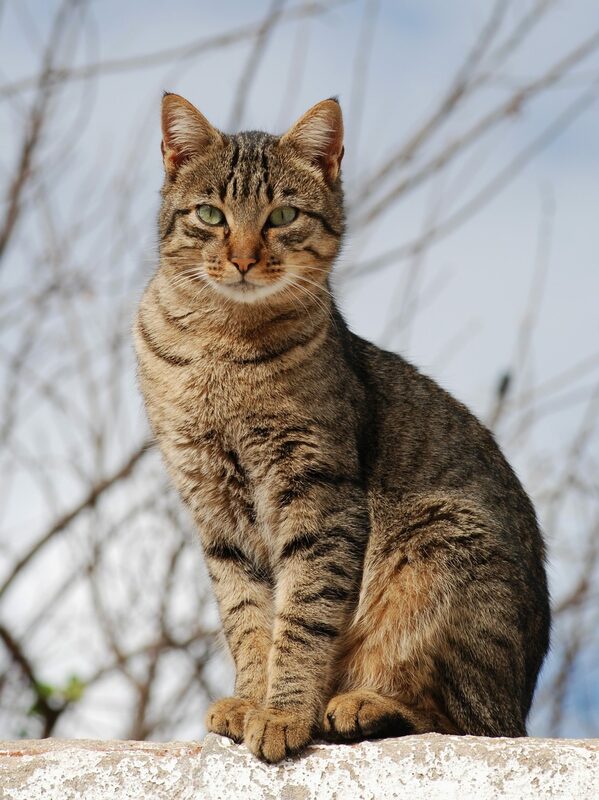 It is easy for a cat to pick up fleas while out roaming the neighborhood or when interacting with other cats. It is important to act quickly if you suspect your cat may have fleas. This can stop one or two fleas from turning into an infestation. The best way to check if your cat has fleas is to look closely to see if you can see small insects in the fur. You can also use a metal flea comb that will catch any fleas. Dip the comb into warm soapy water after each stroke to kill any fleas that it catches. You will need to treat your animal for fleas if you find them. The best way to do this is through a treatment that will work against all stages of fleas. There are topical treatments where you apply an oil to their back or you can give them an oral medicine that will stop the fleas. This will stop the fleas in their tracks. You may also want to try a powder or shampoo to immediately kill all of the adult fleas on your pet. However, these will only provide a temporary solution. It is best to use a preventative measure each month to stop this from happening again. You can ask your vet for a recommendation or buy an over-the-counter option like a flea collar. Fleas spread quickly and they will not just stay on your pet. If your cat has fleas, there is a good chance that fleas are lurking somewhere else in your home and they may be waiting to hop onto you for their next meal. You can begin by washing all of your bedding, and vacuuming thoroughly. This is often not enough and you need to consider treating your entire home for fleas. A professional exterminator can help you quickly eliminate the fleas in your home with a treatment. You can also help to prevent fleas by treating your yard for fleas. 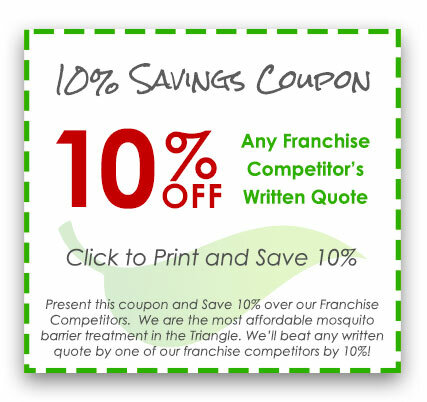 Contact Mosquito Tek to learn more about exterminating fleas in and around your home or business. Ticks have a bad reputation for a good reason. These small parasitic pets will attach themselves to a host and feed for up to 48 hours at a time. When attaching with the host, the saliva from the tick will mix with the blood of the host and this is how the disease is spread. Ticks can be difficult to spot and make it hard to prevent the transmission of disease. Here are some diseases that ticks can transmit. Lyme disease is a serious condition that is prevalent throughout the United States. It is spread by the blacklegged tick. Lyme disease can be treated with a round of antibiotics. Catching and diagnosing Lyme disease early can help prevent the more serious symptoms from developing. If it takes years to diagnose the disease, it may take much longer to recover and some people’s health may never fully recover. Tularemia is a rare disease. There are other forms of it but you will not catch them from a tick bite. Antibiotics are effective at treating the disease. If you think that you have contracted tularemia or develop an open sore where you were bitten, you should seek medical attention. Rocky Mountain spotted fever is spread by the brown dog tick. It is prevalent throughout the United States. The rash may develop later, which can make Rocky Mountain spotted fever difficult to diagnose. Catching the disease early is essential to prevent further complications. The disease can be treated with antibiotics. If not treated early, it can lead to death. Some severe cases may require amputation of limbs due to damage of the blood vessels. If you are worried about your family possibly being bitten by a tick, you can treat your yard. The technicians at Mosquito Tek can apply a barrier spray that will eliminate ticks in your yard and stop new ones from coming. Learn more about flea and tick extermination treatments.